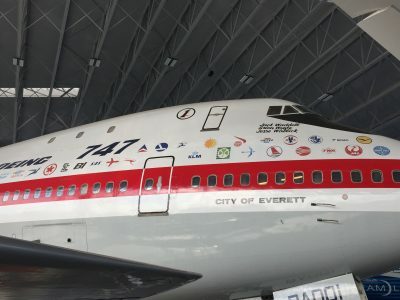 The Boeing 747 is 50 Years Old and still Working Hard. The 747 is one of the greatest airplanes in aviation history. You will marvel at the amazing Boeing 747 and its five decades of extraordinary service. Come and celebrate the 50th anniversary of this pedigree airplane. Rarely do the commercial aviation and spirituality share the same conversation — unless it’s the 747 we’re talking about. It’s hard to look at a 747 without focusing on its most distinctive feature — its upper deck. The position of this second-story annex. The upper-deck’s design is smoothly integral to the rest of fuselage. The 747 design is a demonstration of the elegant, almost organic flow of the jet’s profile. In the 1990s, Boeing ran a magazine promotion for the 747. It was a two-page, three-panel ad, with a nose-on silhouette of the plane against a dusky sunset. Nothing nailed the plane’s mystique more than that ad. The plane’s replacement is Boeing’s own 777-300, which can carry almost as may people as a 747, at around two-thirds of the operating costs, that has rendered the four-engine model otherwise obsolete. Pretty much every 777-300 that you see out there — and there are hundreds of them — would have been a 747 in decades past. The -300 has quietly become the premier jumbo jet of the 21st century. Here are the 27 original customers. You may wish to reference this article’s photograph as you go along, left to right. Twenty-seven carriers got things rolling, though many more would follow. KLM (The Netherland’s ??) is the world’s oldest airline, and this logo, a masterpiece of simplicity, is still in use today, only barely altered. There are 17 747s in the KLM fleet. With United out of the picture, KLM joins Lufthansa, Qantas, El Al and BOAC/British Airways as the only members of the original 27 to have operated the jet continuously since 1970.